The Cloughan will be the venue for the Qualifying 1 match of the day on Saturday when Clogher Valley will be in town to take on Ballyclare. Two weeks ago Robert Boyd’s lads left Instonians’ unbeaten record in tatters and this weekend they will be aiming to see off the men from Fivemiletown. Last Saturday, Ballyclare were clear favourites at bottom side Ballymoney but they were made to battle all the way for a 13-10 success. Backed by a strong wind and driving rain, the visitors dominated territory but had only a Robert Smith penalty to show for their efforts at the break. After 30 minutes a ‘Clare handling error presented ‘Money with a five-metres scrum, from which they scored an unconverted try. The odds favoured the home side in the second session, but Ballyclare were soon back in front when the ball was recycled to Willie Logan who broke through two tackles for a score that Smith expertly converted from a tight angle. Heavy conditions and cold hands contributed to many errors and stoppages, but Smith landed his second penalty to stretch the lead to 13-5. With Ballyclare attempting to run down the clock, Ballymoney reduced the deficit to three points with a last-minute unconverted touchdown. With eight wins and fourth in the table, Ballyclare have adapted well to conditions in their first season in Qualifying 1. The 2nd XV defeated Coleraine II 15-0 in a Junior 1 fixture, while the 4th XV had a comprehensive win over Grosvenor III. 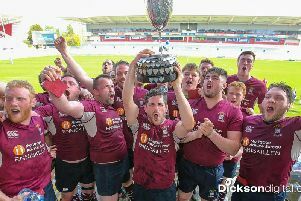 Fixtures: 1st XV v Clogher Valley; 2nd XV v Banbridge III; Ards III v 3rd; Armagh III v 4th XV.